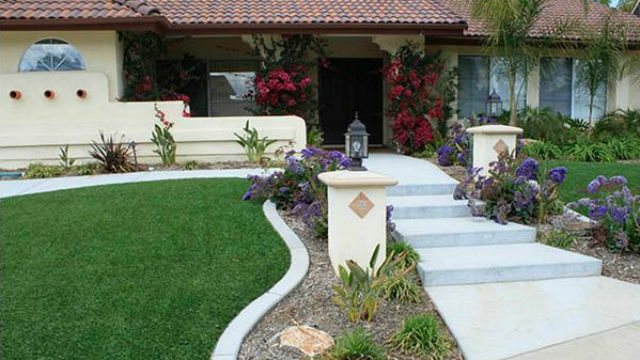 To help homeowners adjust to the continuing California drought, the San Diego County Water Authority is offering savings on drought-resistant plants and artificial turf. The water authority and nearly a dozen local water agencies have teamed with Home Depot to offer savings on water-efficient plants at a series of “Garden Friendly Plant Fairs” through May. The first is scheduled for Saturday, Feb. 21, from 8 a.m. to noon at the Hope Depot store at 3555 Sports Arena Boulevard. A complete schedule is online. Specially marked containers of low-water-use plants such as lavender, bougainvillea, society garlic and rosemary will be discounted during the plant fairs. Industry experts will be at the events to provide information about water-efficient irrigation, and how to select and grow low-water-use plants. The artificial turf program offers a 10 percent discount on turf materials and installation from participating retailers, including Turf Evolutions, EasyTurf, Hellas, Athletic Turf Solutions and Players Turf USA. The program is open to residential and commercial property owners. No application is necessary. Customers can call any of the participating vendors and mention the water authority’s program. “Conditions for 2015 aren’t looking great, and it’s critical that each home, business and public agency find additional ways conserve, whether it’s a simple step such as taking shorter showers or a bigger commitment such as replacing water-intensive lawns,” said Mark Weston, chairman of the water authority.